I really fell in love with William Blake's works (I am a sucker for watercolours), especially "Satan in His Original Glory." The ink and watercolor piece depicts Satan as he was originally - a perfect angel of God's creation, you know, before he launched war on God and then was expelled to Hell. And, let me tell you, Satan in his original form is pretty damn majestic. 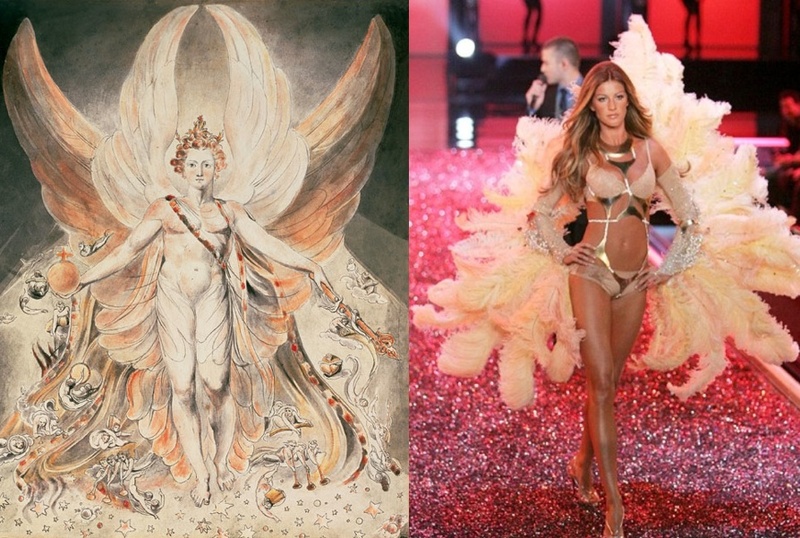 For whatever reason, when I first saw this piece, I thought of the Victoria's Secret Angels and their gorgeous wings. It's not too far off, is it? Both Lucifer and Gisele have the most fab wings on their backs - even in similar color schemes. And a pre-Fall Satan was quite feminine looking as well - with some fake tan and hair extensions, he could be up there strutting his stuff alongside the other VS Angels. Though, Gisele wins because I doubt Satan ever had Justin Timberlake crooning "SexyBack" behind him. Nice comparison. I don't know much about art or fashion so I'm learning about both by reading your posts:) Have a nice Sunday! i can completely see the comparison. i had no idea that satan originally looked like this, i am now going to google!